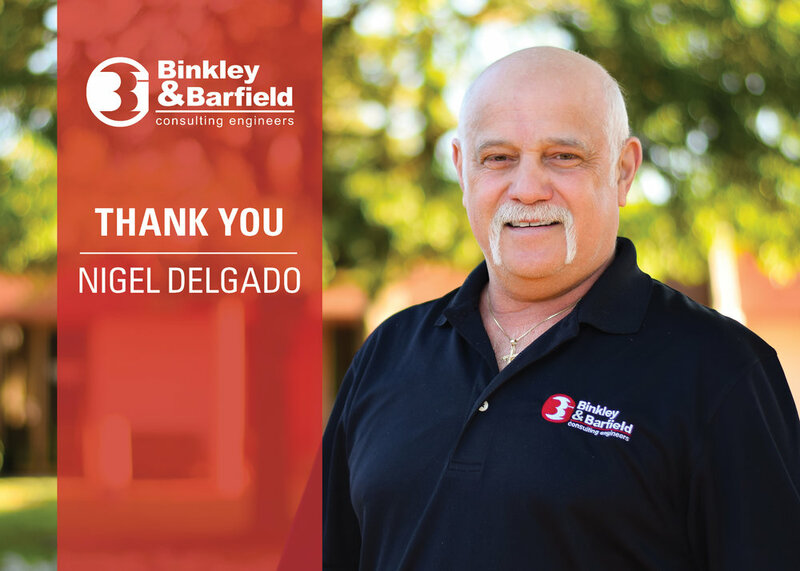 Nigel Delgado To Retire From Binkley & Barfield, Inc. after 23 Years of Service — Binkley & Barfield, Inc. It is with warm wishes that we announce the retirement of Nigel Delgado from BBI on May 15th. Nigel started out as a drafting aid in the engineering industry 40 years ago and has been an esteemed member of the BBI family for 23 years. Nigel enjoyed his time with the BBI family and said he was always excited to come to work every day knowing he was part of a wonderful, hardworking, and dedicated company that cherishes their employees. He stated one of the most beneficial things about BBI is the family culture and the appreciation for their employees. He also enjoyed being able to watch BBI expand over the years and grow into the company that it is today. After retirement Nigel plans to spend quality time with his wife (who also retired 2 weeks ago), catch up on home improvements, and travel to the east coast in their RV. There they will participate in chili cook-offs while looking for their new retirement home somewhere on a lake or by the beach so they can enjoy the water and relax. Nigel thanks everyone at BBI for their love and support throughout the years. While he's sad to say “goodbye,” he's also excited to see what the future holds for him. "While his presence will be missed in the office, Nigel’s great work will never be forgotten,” said Corporate Vice President/Partner Youssef Laham, PE. "His commitment to excellence will leave a lasting mark on each of us. He was always readily available to lend an ear and help solve any problem. We will all miss him very much and wish him the best in retirement. Thank you, Nigel, for being a tireless professional, a helpful coworker, and a good friend to many of us." The BBI Family of Companies want to express our sincerest gratitude to Nigel for his contributions during his tenure and extend our best wishes to him on his retirement.